You are here: Home / Kitchen Tips / What is the Best Seasoning for Chicken? Have you ever wondered what spices to use with chicken? Find out the best seasoning for chicken, and get a printable cheat sheet to keep in your kitchen! What Herbs & Spices Go With Chicken? Chicken is pretty versatile in the kitchen. You can do so many things with it! While many spices go well with chicken, these are some of the more common seasonings, and the ones that pair with chicken the best. Be sure to check out these posts for free printable lists of seasonings that pair well with other meats. How Do I Season Chicken? I typically either use McCormick’s spices or Penzey’s Spices. I like McCormick’s because they are easy to find in my grocery store, are decently priced, and the flavors are consistent. If I’m making something special, or feeling like treating myself, I’ll go with Penzey’s Spices. I do need to plan ahead for Penzey’s, since there isn’t local store and I need to order online. They do tend to be more expensive, but I enjoy using them for special occasions. Cilantro adds a fun, fresh flavor to chicken. Use it in dishes with a Mexican theme. Dill Weed (not the seeds) is great when you’re serving chicken with potatoes or rice. Garlic goes with everything! Use garlic powder, minced garlic, or roasted garlic to give chicken dishes more flavor. Garlic works well with Italian seasoning; or with any combination of parsley, rosemary, sage, and thyme. These citrus flavors work very well with chicken. Marinate chicken in a lemon- or lime-based marinade, or sprinkle cooked chicken with fresh juice before serving. Marjoram has a similar flavor to oregano, but it is not as strong. Marjoram pairs well with rosemary, lemon, or lime. Paprika will give chicken recipes a subtle, smoky flavor. Use a bit of paprika in chicken recipes with Italian seasoning, marjoram, parsley, rosemary, sage, or thyme for a little extra flavor. Parsley, like dill, is great for a fresh flavor. Parsley works well with lemon or with Italian seasoning, marjoram, rosemary, sage, and thyme. Rosemary can have an overpowering flavor, so use it sparingly. It tends to have a hint of citrus flavor, so try it with lemon or marjoram. Sage is a good flavor to use with chicken, but a little goes a long way. Pair sage with garlic, paprika, parsley, or thyme. Thyme has a similar flavor to marjoram, but without the lemony undertone. Try thyme with garlic, parsley, or sage. If you want spicy, Chili Powder is the seasoning for you! Chili Powder works with chicken in any kind of Mexican-inspired dish, or with chicken chili. Pre-packaged Italian Seasoning mixes usually include a combination of basil, oregano, and thyme. Many of the pre-made spice mixes also contain salt. You can easily make your own “Italian seasoning” by combining these three herbs. I love using Lemon Pepper seasoning on chicken. (This one from Lawry’s is my favorite.) It gives it a light, fresh flavor, without too much effort. Sprinkle it on before grilling, or top cooked chicken with a dash of Lemon Pepper. Poultry Seasoning usually includes sage, thyme, marjoram, rosemary, and sometimes nutmeg and black pepper. As the name suggests, it is an all-purpose seasoning for chicken. 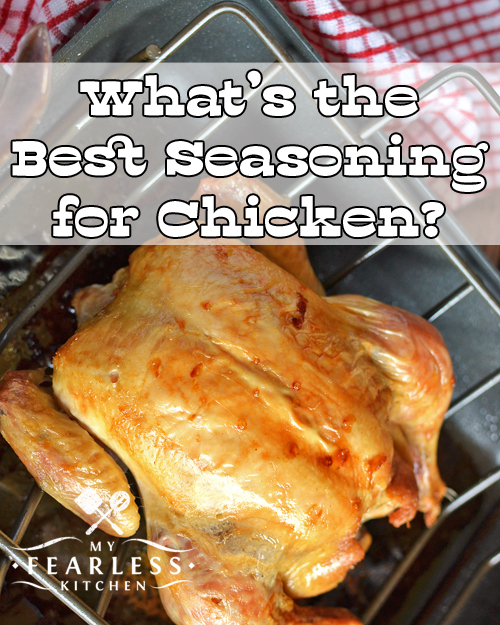 If you don’t know what else to use, Poultry Seasoning is a great one to reach for! You can never go wrong with Ranch flavors. Whether you’re topping a grilled chicken breast with ranch dressing or using dry ranch mix as a seasoning rub, ranch goes great with chicken. What is your favorite flavor combination to use on chicken? 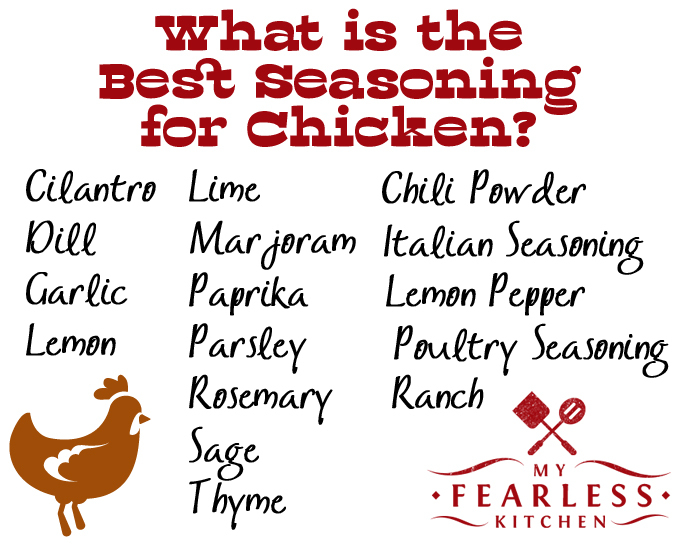 Free Printable for What is the Best Seasoning for Chicken? Do you want a printable version of this cheat sheet for your kitchen? This way, you’ll always know what is the best seasoning to use with chicken! Click here to get the printable. What’s the Difference Between a Brine and a Marinade?